Blue Hole Park Pond: Richard Martinez of Tucumcari caught a 21-inch, 5-pound rainbow trout Jan. 10. He was using a Pistol Pete under a bubble. Eagle Nest Lake: Tom Tighe of Mora caught a 20-inch rainbow trout Jan. 9. He was using a jig and night crawler combination. Seven Springs Brood Pond: Orlando Martinez, age 9, of Albuquerque caught a 30-inch, 11-pound brown trout Jan. 12. He was using a silver Kastmaster on 6# test line. Tingley Beach: Jacqueline Valenzuela, age 4, of Albuquerque caught a limit of trout Jan. 9. She was fishing the Youth Pond and using red and white PowerBait power eggs. 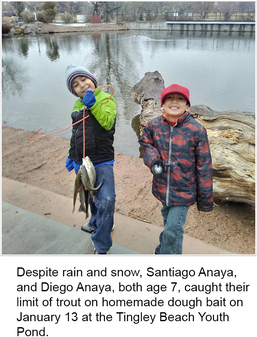 Santiago Anaya, age 5, and Diego Anaya, age 7, of Albuquerque each caught a limit of trout Jan. 13. They were fishing the Youth Pond and using homemade dough bait. 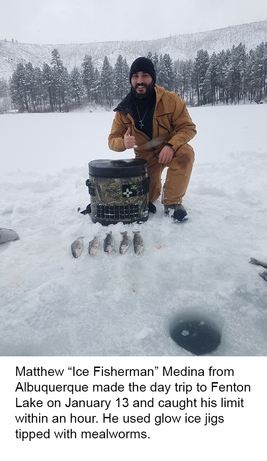 Eagle Nest Lake: Ice fishing was very good using small ice jigs tipped with a piece of worm, a wax worm, corn or PowerBait for a mixed bag of rainbow trout and perch and an occasional pike and kokanee. As of this past Sunday, the ice thickness was about 13 inches near the south boat ramp. Pecos River: Stream flow near the town of Pecos on Monday morning was 24.5 cfs. We had no reports from anglers this week. Red River: Stream flow below the hatchery on Monday morning was 22.2 cfs. Fishing was fair using salmon eggs and PowerBait for trout. Rio Grande: Stream flow at the Taos Junction Bridge was 330 cfs. Fishing was fair using wooly buggers, San Juan worms, and salmon eggs for trout. Fishing pressure was very light. We had no reports on other species. Rio Mora: Stream flow on Monday morning was 5.02 cfs. We had no reports from anglers this week. Ute Lake: Fishing remained slow for all species with extremely light fishing pressure. Abiquiu Lake: About 50 percent of the lake has been covered with a thin layer of ice in the morning hours but clearing off by mid-day. The concrete portion of the boat ramp is out of the water. Extreme caution should be used when attempting to launch a boat. We had no reports from anglers this week. Animas River: Water flow below Aztec on Monday morning was 185 cfs. We had no reports from anglers this week. Albuquerque Area Drains: Trout fishing on the Albuquerque, Belen, Corrales Riverside and the Peralta Drain this past week was good using wax worms, Fire Balls, PowerBait, custom tied flies and small spoons. We had no reports on other species. Bluewater Lake: The lake is closed to fishing at this time due to dangerous ice conditions. For updated conditions, call the state park office at (505) 876-2391. Chama River: Monday morning flows below El Vado and Abiquiu were 24.2 cfs and 138 cfs respectively. Trout fishing below Abiquiu was good using streamers, San Juan worms, small bead head nymphs and salmon eggs. We had no reports from below El Vado. Fenton Lake: The lake has opened for ice fishing with an ice thickness of 7.5 to 9 inches. Anglers are advised to stay off the northern part of the lake where the river feeds in due to slushy ice conditions. Fishing was very good using wax worms, salmon eggs and PowerBait. Matthew Medina of Albuquerque reported great fishing. He caught a limit of trout while using Glo jigs tipped with meal worms. Jemez Waters: Stream flow on the Jemez near the town of Jemez on Monday morning was 19.1 cfs. Fishing below Battleship Rock was good using salmon eggs for trout. All of the streams north of Battleship Rock are frozen over. Navajo Lake: Fishing was slow for all species. Fishing pressure was light. San Juan River: Stream flow below Navajo Lake on Monday morning was 293 cfs. Fishing through the Quality Water area was fair to good using mini macs, disco midges, red larva, egg patterns, white bunny leeches and princess nymphs. Through the bait waters, trout fishing was fair using salmon eggs, small Kastmasters, egg patterns and worms. Seven Springs Brood Pond: Fishing was very good using spoons for trout. Tingley Beach: Fishing was very good using homemade dough bait, PowerBait, power eggs and wax worms for trout. Fishing for all other species was slow. Alumni Pond: Trout fishing was very good using corn, Velveeta cheese and PowerBait for trout. Bill Evans Lake: Fishing was good using PowerBait, homemade dough bait and Fire Balls for trout. We had no reports on other species. Elephant Butte Lake: Fishing was fair using spoons and blade baits for white bass, catfish and an occasional largemouth and walleye. We had no reports on other species. Escondida Lake: Fishing was good using homemade dough bait, PowerBait and garlic cheese for trout. We had no reports on other species. Gila River: Stream flow on Monday morning was 252 cfs. We had no reports from anglers this week. Rio Grande: Stream flow below Elephant Butte Monday morning was 2.00 cfs. Fishing was good using PowerBait, Fire Balls and worms for trout. One catfish was caught by an angler using PowerBait. We had no reports on other species. Young Pond: Fishing was very good using garlic cheese, corn, power eggs and PowerBait for trout. Berrendo Creek: Fishing was good using PowerBait, salmon eggs and Pistol Petes for trout. Black River: Stream flow at Malaga on Monday morning was 13.9 cfs. Fishing was fair to good using small spoons, salmon eggs and PowerBait for trout. Blue Hole Park Pond: Fishing was very good using PowerBait, cheese and Pistol Petes under a bubble for trout. Several limits were reported. Bosque Redondo Lake: Trout fishing was fair for anglers using PowerBait, corn and Pistol Petes. Brantley Lake: Fishing was slow to fair using jigs and spoons for white bass and largemouth bass. We had no reports on other species. Chaparral Park Lake: Fishing was good using PowerBait for trout. A few trout were also caught by anglers using salmon eggs and Pistol Petes under a bubble. El Rito Creek: Fishing was good using PowerBait, Gulp eggs and salmon eggs for trout. Greene Acres Lake: Fishing was good using worms, PowerBait and small spoons for trout. Grindstone Reservoir: Fishing was good using PowerBait for trout. Fishing for all other species was slow. Jal Lake: Fishing was good using worms and PowerBait for trout. Pecos River: Stream flow below Sumner Lake on Monday morning was 15.5 cfs. Fishing was fair to good using PowerBait, worms and salmon eggs for trout. We had no reports on other species.